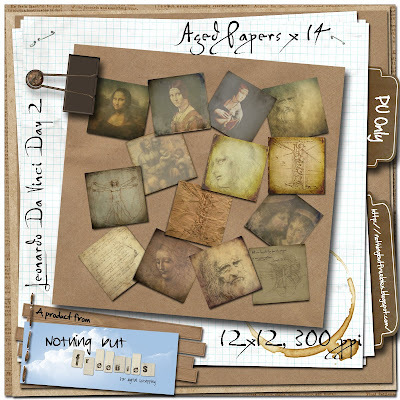 Today’s Paper Pack is made from Leonardo’s paintings and sketches and are all aged (well, of course they are aged, they are more than 500 years old!). I hope they too will be among “The Populars”. And Jody, you can relax - I assure you that The Last Supper is on it’s way. See you all again tomorrow? By the way – I have expanded this blog with a Gallery where you can see some of my personal scrapbook pages. Please go to the top menu, and if you have the time for a comment, I would love to here what you think. Your papers are one of the bests! Beautiful work, thank you for sharing them with us. Aged or not..I love your papers! Thanks so much! These papers are great - just like all the work you create. Thanks for sharing. Thanks again for more great papers!